Sparkle Optics manufactures high-power, high-pulse-energy, diffraction-limited nanosecond Illuminator lasers at 1-micron (infrared) for Directed Energy and other applications. Lasers with average power up to 200 W are standard. 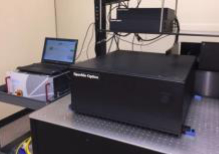 Sparkle Optics can supply custom Illuminator lasers with average power up to 1 kW. Due to significant customization, each laser is different. The specifications for 100-W and 200-W lasers are available for downloading. Specifications of other products are available upon request.